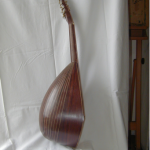 What has been said for the tenor mandola is valid for the contralto one as well. This instrument possesses a medium high sound range but its position within musical literature or regarding its tuning has never been clear and this has lead me to design a tenor model in order to distinguish the E – A – D – G tuning from the proper contralto one (A – D – G – C), required by its diapason (430 millimeters or 172 inch.). Weight : about 900 grams; (1,98 lbs). 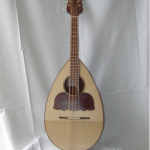 Types of wood employed : maple and rosewood for the body, firwood for the front of the harmonic box, ebony and rosewood for the fingerboard.